Forget about that idea we mentioned the other day, about Microsoft sitting back and collecting royalty fees on smartwatch patents, while others do the heavy lifting. A new rumor has just started spreading about Microsoft's entrant into the smartwatch business. 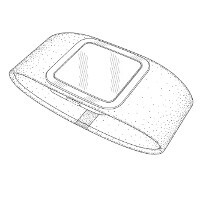 According to the speculation, the timepiece will carry 11 sensors, support multiple platforms, and feature a display on the underside of the band. Some of you watch wearers do find it easier to turn your palm up, to look at the time. Instead of going with a larger rectangular display like the LG G Watch, or a circular one like the Motorola Moto 360, Microsoft has allegedly opted for a fitness band styled device, similar to the Nike Fuel band. Besides the 11 sensors, those familiar with the device say that it has open APIs, and will work on iOS, Android and Windows Phone. The interface is said to be "slick". The Microsoft smartwatch is rumored to be coming into the world sometime in October. Like many of the upcoming smartwatches, it will take readings of some health metrics, like your heart rate, and send the information wirelessly to your smartphone or tablet. From there, all of your information will be analyzed. While FDA approval might be required for a diagnosis, the data that comes from the watch might be able to tell you about what kind of Doctor you need, in order to feel better. Seems to be based on the patent that Nokia acquired an year ago. Good job jabbing at Microsoft in the other article Alan, maybe an edit to the other one or update. Seems that most articles about Microsoft on this site are written with a bit of hate or "do I have to write this article" and anything iPhone or Android is posted with great excitement. Yep, because everybody should love and worship Microsoft like your sorry self and not be objective. I appreciate that it supports multiple platforms. Other smart watch makes should do the same. I think it's a smart idea to build name-share. Xbox is also compatible with Android/IOS tablets. Seems to be their plan to put "Microsoft/Windows" everywhere and than push people over to buying their phones slowly.